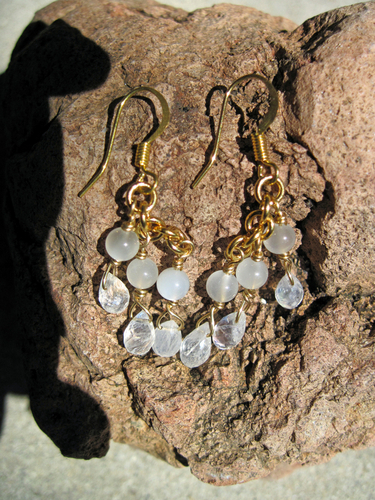 The earrings are made with white moonstone beads and hand-cut rainbow moonstone drops. They are about 2" long and have Surgical Steel ear wires. 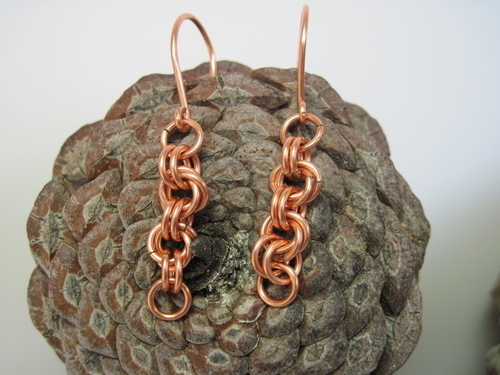 The earrings are made with copper and are in the 4-in-1 chain maille weave. They are about 2.25" long and have hand-crafted copper ear wires. 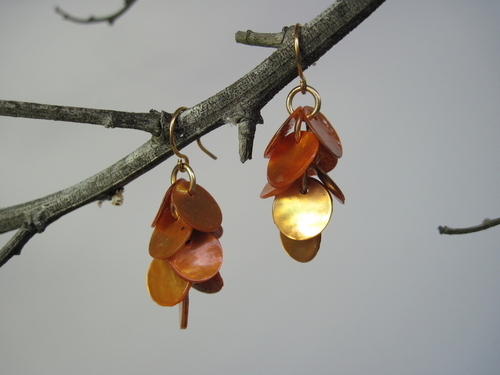 The earrings are made with bronze shell disks. They are about 2" long and have 14K gold-filled ear wires. 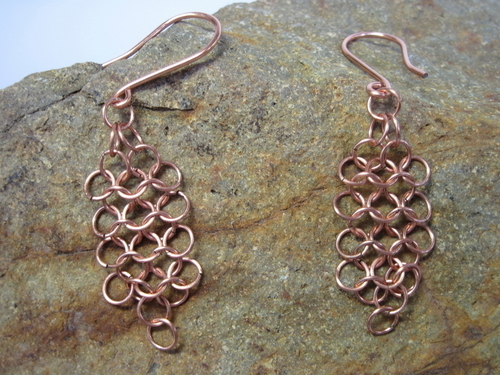 Earrings are copper chain maille in a flower pattern. They are about 1.75" long with hand-craftd copper ear wires. 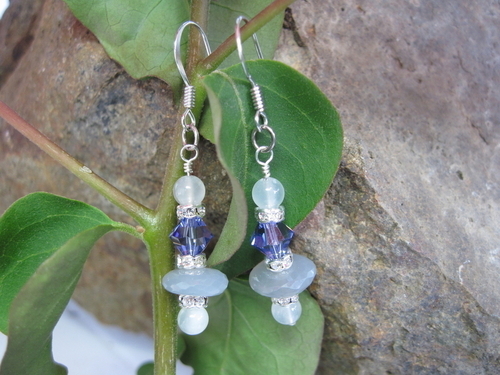 The earrings are made with white moonstone, hand-cut gray moonstone, and amethyst Swarovski crystals. They are about 1.5" long and have surgical steel ear wires. 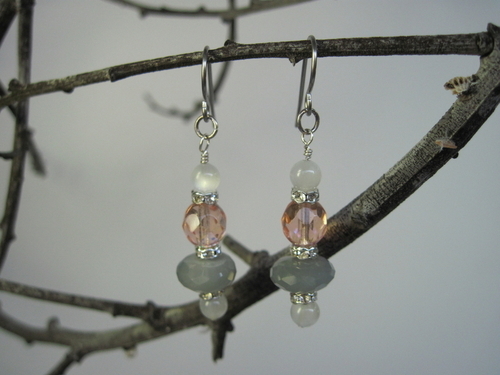 The earrings are made with white moonstone, hand-cut gray moonstone, peach Czech glass, and Swarovski crystal rondells. They are about 1.5" long and have surgical steel ear wires. 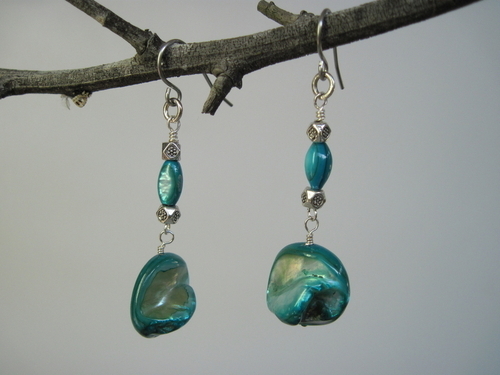 Earrings are made with fresh-water pearls and mother-of-pearl beads with pewter accents. They are about 2" long and have surgical steel ear wires. 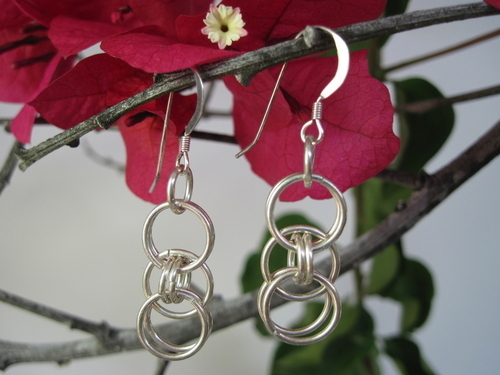 Earrings are sterling silver chain maille in the Helm pattern. They are about 1.5" long and have sterling silver ear wires. 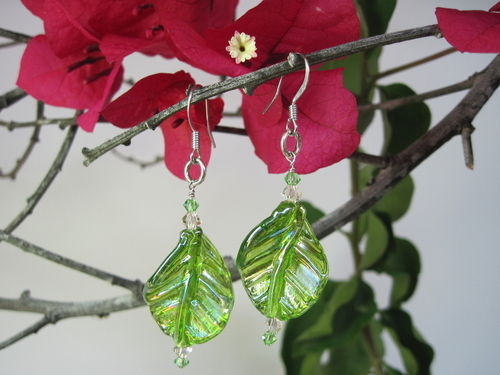 Earrings are made of iridescent green glass beads with green and yellow Swarovski crystal accents. They are about 2.25" long and have surgical steel ear wires. 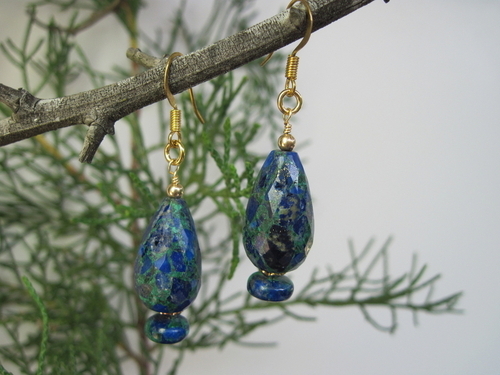 Earrings are an interesting mixture of blue and green-azulite and malachite-and are about 2" long. They are accented with 14K gold-filled beads and disks and have surgical steel ear wires. 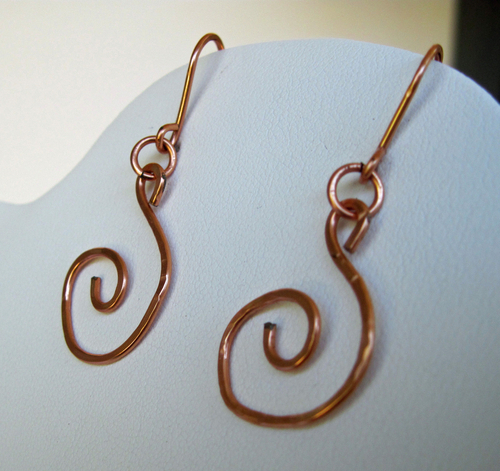 The earrings are hammered copper spirals. They are about 2 inches long and have copper ear wires. 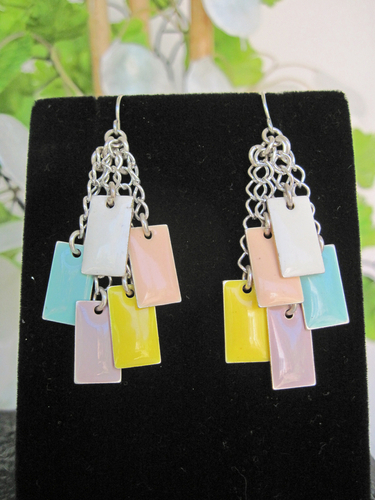 These earrings are made with enameled rectangle pieces in pastels of peach, yellow, aqua, lilac, and white. They are about 1.75" long and have surgical steel ear wires. 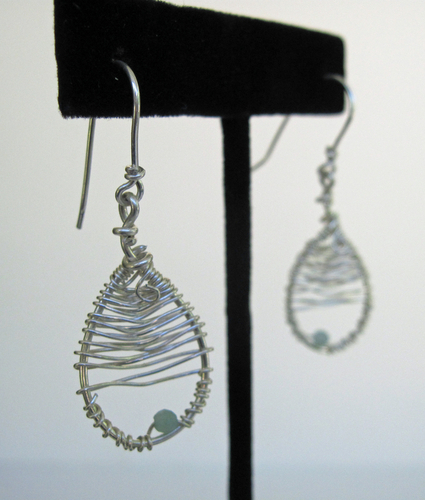 These earrings are made with fine silver wire, hammered for texture. They are about 3.5" long with fine silver ear wires. These free-form earrings are made with 14K gold-filled wire. They are about 2" long and have 14K gold-filled Euro-wires. 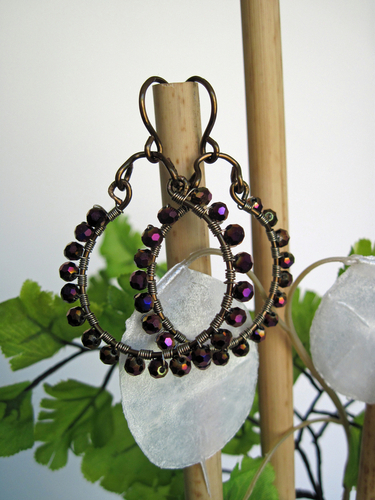 The earrings are made with plum crystals wrapped on antique bronze wire circles. 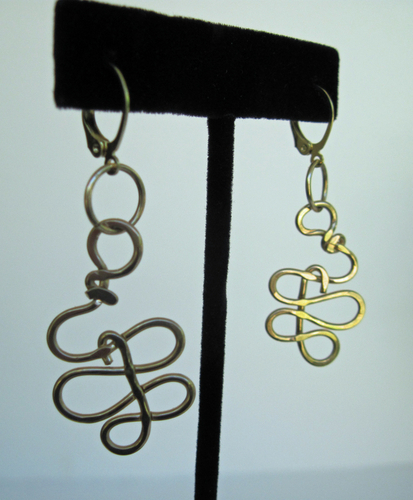 They are about 2" long and have bronze ear wires. 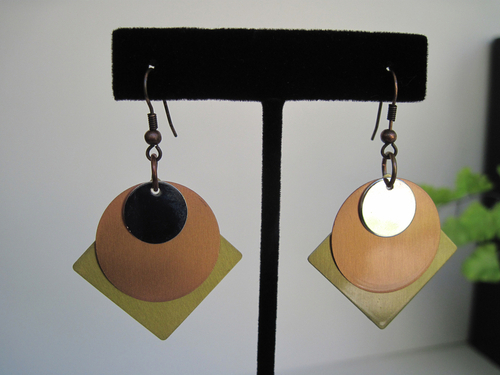 Earrings are made with a silver diamond, and gold and copper circles, all base metal. The earrings are about 2.25" long and have surgical steel ear wires. 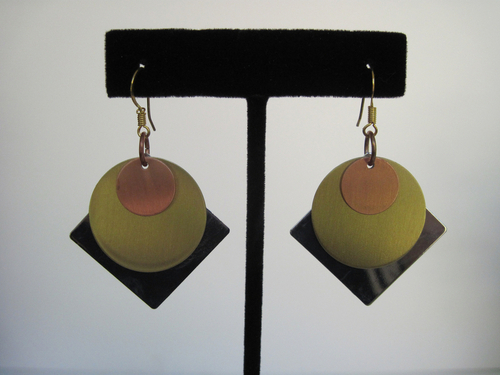 Earrings are made with a gold diamond and copper and silver circles, all base metal. They are about 2.25" long and have copper ear wires. Sterling silver drops are wrapped with fine sterling silver wire with a tourmaline accent bead. 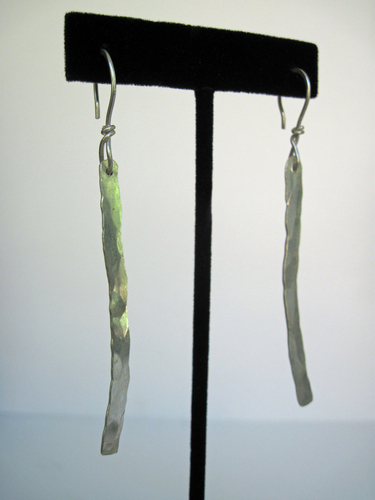 The earrings are about 1.75" long and have sterling silver ear wires. 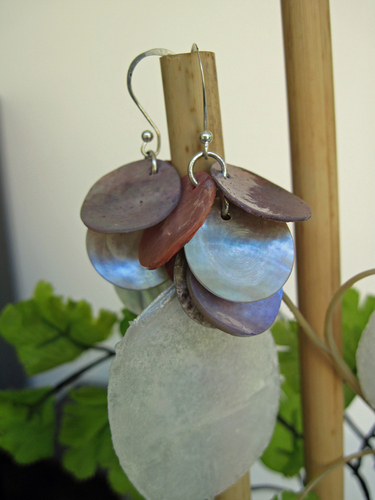 Earrings are made with mother-of-pearl disks in lavender, pink, and gray. They are about 1.5" long and have sterling silver ear wires. 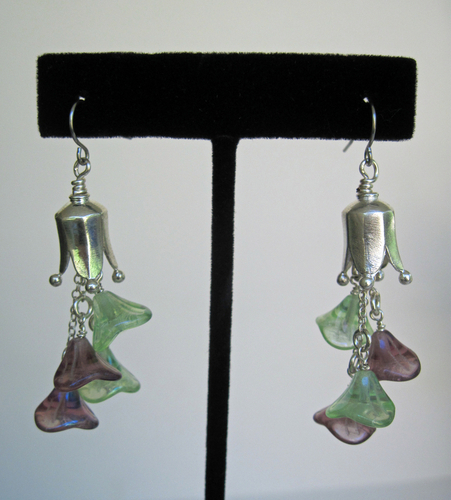 These earrings are made with purple and green Czech glass flowers hanging on sterling silver chain and topped by a pewter cap. They are about 2.5" long and have surgical steel ear wires. 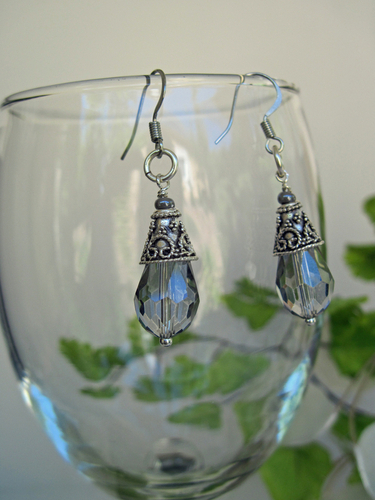 Earrings are made with a Czech crystal drop in smoky gray and has pewter caps. The earrings are about 1.5" long and have surgical steel ear wires. 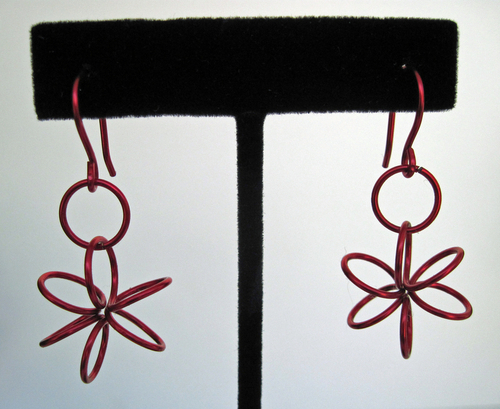 These earrings are made with bright red Parawire. They're about 1.75" long and have red Parawire ear wires.